Dani Karavan was born in Tel Aviv in 1930, but later moved to Italy, due to his deep interest in Renaissance humanism and the work of great architects like Filippo Brunelleschi and Leon Battista Alberti. Karavan’s oeuvre has always shown his strong social commitment, especially in connection with exile and collective memory. Due to the simplicity of their vocabulary, his monumental, though minimalistic, interventions merge with the landscape, as location (including not only its physical characteristics, but the historic background too) becomes an essential factor in the final conception of the artwork. 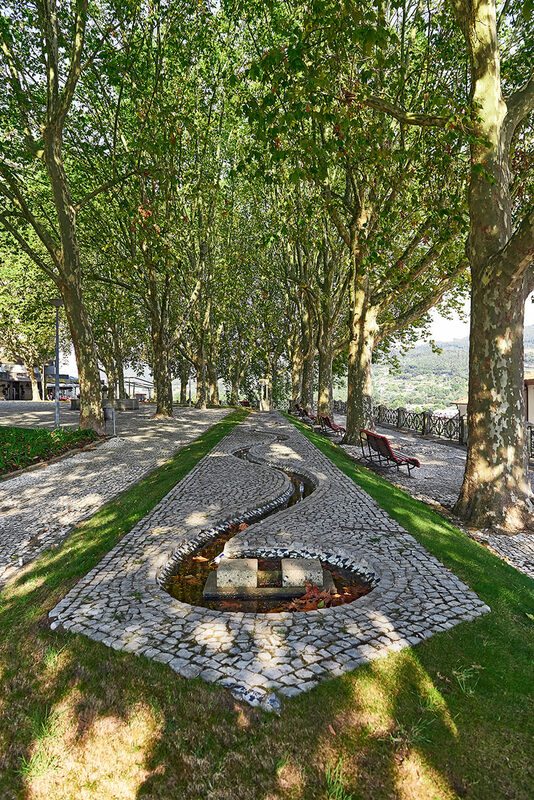 This characteristic was also mentioned by the artist himself, when commenting on the project put forward to the 5th Santo Tirso Symposium of Contemporary Sculpture: «To me, Column-Fountain is as important as all the other large monuments I have designed all over the world. In fact, size is not important in my work. Every project of mine grows from my encounter with the environment. It guides me. I try to understand what the place wants from me. It determines even the material to be used. When I first visited Santo Tirso, I was very interested in the monastery, the courthouse and its columns, the open spaces, the views and the architecture. Then I put forward a project, and it was accepted. Now, if you look closely, you will find a strong relationship between the courthouse and my piece». Dani Karavan’s Column-Fountain shows a correlation between a vertical element, made up of two schematic columns standing on a plinth, and the horizontal plane of a canal winding along and redefining one of the sides of the Carvalhais garden. The tall columns seem small when compared to the large water canal, whose length gives the place endless allegorical possibilities, especially when the viewer is encouraged, at Karavan’s suggestion, to establish a relationship between this symbolically loaded place and the courthouse — the main institution upholding the rights of Santo Tirso’s citizens to equality, order and justice.